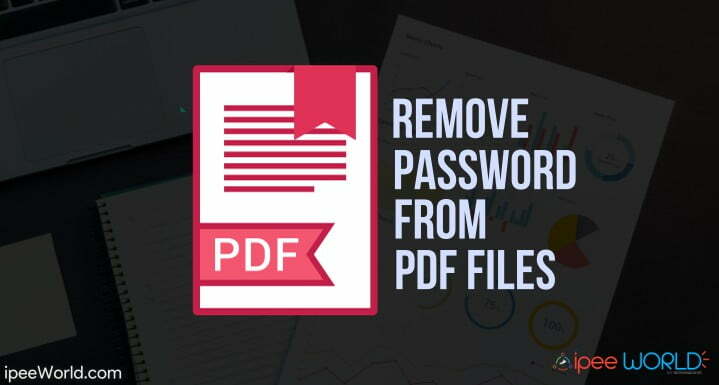 Do you want to remove Password from PDF Files? Then you guys are in the right place. There are a lot of situations where we are required to remove password from PDF Files. Let’s say that you are having a PDF File protected with a password and now you wanted to give it to someone else or you want to have it without the password. That means, after the password removal process you are no longer required to enter the password to open the PDF file again. I will mention two different methods below. The first one is that you know don’t know the password, so you want to crack it using some other software mentioned below in the article and the second one is that you already know the password and you just want to permanently remove the password. Whatever be your case, this article will help you to get rid of the password from PDF Files. At first, let’s see how we can recover pdf password when we forget it. This is the case where we are having no idea about the Password. PDFCrack is the software that we are going to use to get the job done. PDFCrack is a simple PDF Password Recovery Software that is available for Windows. This software comes really handy when you want to recover PDF Password. PDFCrack is not for Password reset or password removal if you are looking for that, then kindly go to the next method mentioned in this article. Assuming that you don’t know the Password of PDF File. PDFCrack is a command line based PDF Password Crack tool which works on Windows 10, Windows 8, and Windows 7. The step is so simple and easy. All you wanted to do is just download the latest version of PDFCrack from the link given below and save it to your computer. The time taken for the password recovery process depends on how long the actual password is. If it is a simple short password then it won’t take that too much time but if it is long and hard to crack password then it might take some time, even Days! PDFCrack installer file is less than MB and comes in a ZIP Package and since it comes as a portable software you are not required to install it. You can also Highly Compress any files in order to ultra compress. Yes, you heard it right. Google Chrome can be used to remove password from a PDF File. If you don’t know, Google Chrome is having a built-in PDF Reader and Creator. If you ever wanted to open a PDF File, you are not required to install any third party software, Google Chrome is what you need. Again, you can also convert any Website or Page into a PDF Document using the Print option in Google Chrome Web Browser. This method is for those who know what the actual password is. Now, let’s see how can use Google Chrome to remove Password from PDF Files. 1. Download the PDF File you wanted to change the password of. If you are a Windows user, then Right-click on the PDF File and Choose “Open With” option and then choose Google Chrome from the list of software that appears. 3. Now, it will ask you to enter the password of the particular PDF File, Just enter the Password and hit Enter. 4. Now, you have opened the PDF File, next is to save the PDF File without Password or remove the existing password from that PDF File. 6. 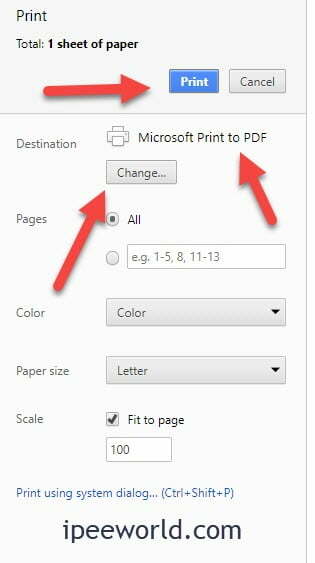 On the menu that appears, Select the format as PDF and hit Print. Specify the filename and location where the file should be saved. 7. Voilaa! Now you have the exact same PDF File without the Password. Now you can share this PDF File with anyone without any problem. It won’t ask you for the password anymore because we have just removed the password from the PDF File. This is how you remove password from PDF Files. Here, I have shared two different methods. The first one is for those who have forgotten the password and have no idea about what the password is and the second method is for those who wanted to change the password of PDF File and make it Password free. PDFCrack is a free software that works as a PDF Password Recovery software that helps us to retrieve the password if we can’t remember it. Share this article with your friends and let them know about this trick and also be sure to comment down below if you have any doubt, suggestions on the same.